Students are learning how to drive in driver education combined with physical education class. Most students do not have a learner’s permit and we use bikes to supplement the classroom phase of driver education. The road signs donated from the Virginia Department of Transportation and set up different driving courses each day. 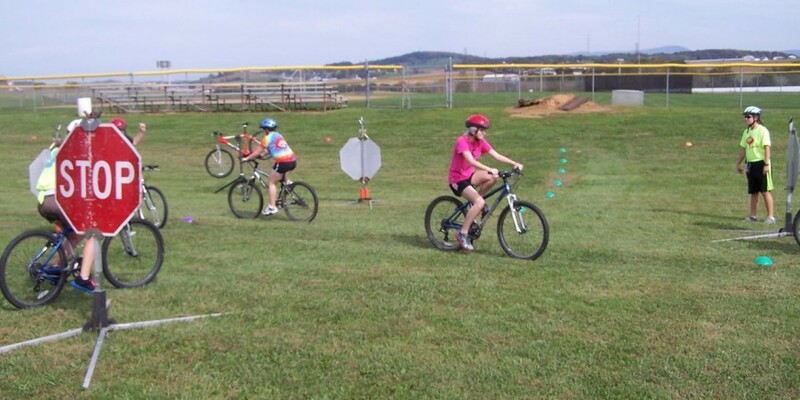 Students in this picture are practicing how to navigate a 4-way intersection and further down the course they are riding through a traffic circle. We also use fire hose that is painted with broken white and yellow lines to divide traffic. White lines divide traffic going the same way and yellow traffic divides traffic going the opposite way. Students are challenged cognitively and kinesthetically while riding on the bikes. Driving is a complex skill and requires problem solving in order for us to be safe. We start on a bike to give them practice on a simple machine with only two wheels. Students will sometimes crash their bike after making a poor decision. We stop the lesson and talk about why the crash occurred and how to prevent one the next time. Most driver education courses are taught by lecture, power point slides, and in a desk. Great teaching occurs when you create a hands-on learning environment, immediately show students the results of their positive and/or negative decisions, allow them to learn road signs and pavement marking identification, and they also get a vigorous cardiovascular workout to combat childhood obesity!